The asterisks are caucus states; the non-asterisks are primary states. 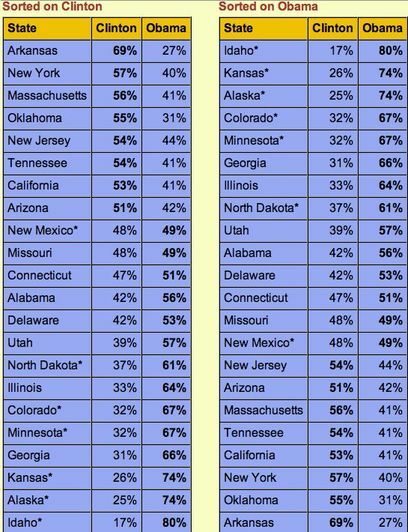 Obama did extremely well in caucus states and Clinton did very badly in them. How come? Turnout in caucus states is always low, usually about 10-20% of the electorate. Only highly motivated people bother to show up, especially the Democratic caucuses, which go on for hours and people have to publicly defend their choice. Obama has a smaller, but extremely active and loyal following, especially among younger voters. These are precisely the people who can swing a caucus state by showing up in droves and working hard to convince the other voters that Obama would make a great President. In primary states, the media, especially TV ads have a much bigger influence. Now it becomes clear why Obama won North Dakota but Clinton won Oklahoma, a demographically similar state in the same part of the country: North Dakota had a caucus and Oklahoma had a primary. This explanation may be too simple, and I would be surprised if the other analyses I've seen (invoking everything from Hispanics to the Kennedys) have no merit. However, the Votemaster's simple hypothesis has remarkable explanatory power: Every one of Obama's top five wins were in caucus states; and of the seven Super Tuesday caucuses, he won them all. I wanted to bring this note up in light of the extensive discussion we've had recently on the caucus system, chronologically: my post disparaging the Iowa 'crockuses', Sara's rebuttal explaining the history and reason for caucuses, Sara's follow-up Part I on Democratic party rules and delegate selection and Part II on how caucuses build party identity particularly through the platform selection process, which she explains. These days, for instance my E-Mail includes about twice a week, proposed resolutions from the Progressive Caucus. You can suggest edits, and they are being debated on line. People will then take them to Precinct caucus, introduce them, and start them up the system. In fact this is one reason I love the caucus -- you have to actually stand up and state and defend your choices and positions. Because success at Caucus frequently depends (really depends) on pre-caucus debate and organization, it is a totally important party building process. [...T]he point of the process is to find the fulcrum of the party strength, and that isn't done by having a ton of one vote minorities hanging on to the process. So at all levels we give sub-caucuses that don't make the option of joining another caucus. The negotiations to join or not join can be powerful. Sara also put out the idea, in comments on another post, that that "I think you will find that caucus states are more liberal or progressive and have more healthy parties." I put that all out there as background for considering why caucus states went for Obama. I don't think it's enough to say that caucus states are more progressive -- certainly, Obama's top wins in Idaho, Kansas, and Alaska, are not representing more progressive states than Clinton's wins in New York and Massachusetts (and California). But this data does suggest that caucuses push the party in a more progressive direction, if you consider Obama the more progressive candidate (I think I do) and especially if you note that his wins were actually in the more conservative states -- showing just how powerful an effect the caucus has. None of these are mutually exclusive, and I bet you can think of yet other reasons why caucuses may favor Obama. My gut says it's because he's great at motivating voters -- and the stronger the filter for really motivated voters, the better he does. In general, caucus goers tend to be younger which benefits Obama. Hillary's core supporters tend to be working class, single women with children and older voters. These are exactly the groups that tend to be underrepresented in caucuses. Also, location makes a difference. If you are voting in a primary, then you go to vote at your local precinct. You are in and out unless there's a long line. If you were voting in a caucus then most likely you had to travel some distance to get to the caucus location and then once there you had to spend some time there in order to "caucus." Hillary's core supporters are exactly the groups who tend to not have the time or means to do so. Single working women have to pay for babysitters if they want to go to a caucus while in a primary they can stop and vote either on their way to work or on their way home. Older voters may need transportation or help getting to the caucus. And if they are handicapped they most likely will be voting an absentee ballot. Blue collar workers may simply be too tired to take the extra 2 hours or more out of their daily grind to attend some boring caucus when they could simply vote at their local precinct on their way to work or on their home from work. Also, what about parents who have children in school? They may have school events that they have to get their kids to on that night. And some may not have the means to leave the children alone at home while they go caucus. So, when you are talking about caucuses, you are mainly talking about those voters who have the time and the means to caucus. These tend to be people who are better-off, younger or very active in the political process. The caucus system gives you a very limited subset of the voting population. And this very limited subset is one that would more heavily favor Obama and may be one reason why the Clinton campaign has not competed in caucus states. Tactically, the winners of caucuses are those campaigns that have great field organizations with a pool of committed and highly active supporters to work from. College students are a natural target for caucusing. This is one of Obama's most committed groups of supporters. For an example, look at the caucus system in Kansas this time. In the past, Kansans have caucused in their respective counties. Each county caucus was held at the county seat. However, this year, there were only 40 caucus sites across the state. There are 105 counties in Kansas. If you were a rural voter who wanted to caucus then you had to drive some distance to a caucus location. However, there were caucus locations conveniently located in all of the cities. Obama's support was heaviest in the cities while Hillary's was heaviest in the rural areas. Just from a tactical point, it would have required a much greater effort to get Hillary's supporters to the caucuses. And keep in mind that her supporters tended to be older and working women with children and working class and then it's not difficult to see why the Clinton campaign wouldn't even try to compete since the resources required would be huge for a small effect. Once you start to analyze the caucus system and who actually votes in a caucus and then you look at Obama's wins, his wins are much less impressive than they appear. As a note of disclosure, I once ran political field operations and GOTV operations in primary and caucus states in my past life. On a related note, I am opposed in general to the caucus system because it tends to ignore the voices of the elderly, the handicapped, the working poor and single women with children. In a primary system, they have the opportunity to vote either at their local precinct or by absentee ballot. So, it's important to recognize how different the electorate is that votes in a primary as opposed to one that is present at a caucus. I once was a party man who thought that the idea of controlling the nature of the electorate that voted in a caucus was simply politics, how you played the game. I was young then. I came to see this process as limiting or stifling the voices of those who most needed to be heard. How do you game the caucus system? By rules setting, locations, timing, etc. If your candidate had greater support in the cities then you would fight for more caucus locations in the cities and fewer in the rural areas. Of course arguing all the time that the cities had more population hence they should have more locations even though you knew that having fewer rural locations would limit the caucus pool in the rural areas. It's a dirty secret of the caucus system that there are forces at work that attempt to game it to give an advantage to their candidate. Actually Ian Welsh at The Agonist pointed out the caucus factor while the Tuesday voting was being tallied. I can't remember where I'd posted it as a comment on some blog but I called it the "wife-beater" effect - a reference to an item I saw on the web after the Iowa caucuses saying that women were reluctant to leave their husband's caucus group (read Obama) and go sit alone in the Clinton group. My thoughts were that if the New Hampshire Obama loss could be blamed on racism (the Bradley Effect) why not blame the Clinton Iowa loss on some sort of corresponding hate tactic? That, rather than simply understanding that polls are often inaccurate. But snide responses aside it is amazing to read the admiration for how small influential groups can sway caucus voting and win the vote count. Considering that we're comparing a non-secret ballot to a secret one, influence may be too mild a term. Coercion and intimidation may well be factors and likely are on some level - peer pressure being the obvious one. In Nevada it was reported that union leaders that sided with Obama tried to get their members to vote along the same lines. Surprisingly in that situation it didn't work. It's just plain hard to view a non-secret ballot as more "progressive" or "liberal" rather than regressive and coercive. It's certainly not an example of a democratic process for citizen polling that I'd consider admirable. Local Public Radio -- which in Minnesota means MPR, has been stuffed all day with conversation as to why Hillary did so badly in the caucus yesterday. Apparently they did not plan to do well, and the Obama surge caught them totally unprepared. After New Hampshire we heard that Hillary had been long prepared with a GOTV plan there -- beginning last summer they identified all their supporters in the state, and then made the late calls, and finally even when necessary had rides to the polls arrangements. They had people in the polls mid-afternoon checking off who had and hadn't voted. While you don't do the same thing for a Caucus, you do something like it -- you start very early and organize down to the precinct level, and apparently Hillary did not invest in organizing in any of the Caucus States that met yesterday, assuming they didn't need that. No supporter ID was done, they didn't appoint Hillary precinct and district leadership, they didn't have a work plan. Talked to a neighbor who had been down in Iowa working for Hillary, and apparently the person nationally running the Caucus State Operation was not a specialist in this sort of organizational effort, and she said it was ragged down there too. I find this strange, because one of the people high up in Hillary's organization is former Senator Mark Dayton -- and yep, he knows about what does and doesn't work in a caucus system. Jon -- I find your Kansas Caucus anything but what I call them. We have 4000 plus Precincts in Minnesota, and thus we have 4000 Precinct Caucuses. The next step up is the Legislative District (about 18 thousand voting age persons)-- we include much of the University of Minnesota, so we have a temp population higher than that -- and apparently about 6000 came out to one of the 14 Precincts, and voted in the DFL Caucus. That is the highest turn-out we've ever had, way higher than back during Vietnam and the Humphrey-McCarthy show down in 1968. Anyhow, I think Hillary's failure here in MN had much more to do with staffing, planning and organization than much else. Yesterday, a Democratic precinct chair from Colorado reported about being curious as to why Obama did so well in the Colorado caucuses (including hers) but only so-so in the nearby New Mexico caucuses. Some investigation showed that the New Mexico caucuses were in reality primaries: people came in, voted, and went home. There was none of the open discussion of the candidates that characterizes the caucus process as we have described here earlier this year. This tends to confirm the theory that Obama does better when there are small groups discussing the candidates where his cadre of enthusiastic supporters can try to convince other voters that he is the best person for the job. As shown in the tables above, New Mexico was Obama's weakest win, despite being a caucus state. This evidence -- albeit with a sample size of one! -- is inconsistent with the idea that caucuses per se disfavor Clinton voter attendance (although the far-flung, urban-centric Kansas caucuses may be another matter), and lend support to hypothesis #4 in the post above, namely that left to their own devices "undecideds" will break about evenly to Obama and Clinton, but when they come face-to-face with Obama supporters they're more likely to be swayed in that direction. Whether that's due to Obama supporters' infectious enthusiasm (no word on a vaccine yet), the attractions of youth and vigor, or issues of dominance and submission between the genders, is anyone's guess. My own guess is that there's a cohesion among Obama supporters that is good at drawing fence-sitters in, by giving them not only a candidate choice but a clearer sense of belonging to something larger than themselves. Although it varied by county, in Boulder county we have almost no time for discussion and persuasion and in fact the presidential discussions that went on made it impossible to complete discussion of the platform, or local candidates. It was more like trying to get into a rock concert then a reasoned town meeting with E.B. White explaining in measured prose the importance of a new footbridge. This was not because the Boulder county party is a bunch of control freak bureaucrats but rather that the caucus rules and state party and campaign requests for results ASAP and the venues rules (schools) limited the time to a couple of hours. A correction to your table. 1) NM's race is not yet settled -- Clinton is actually ahead of Obama by 1,000 votes right now, but provisional ballots are still being hand counted. 2) The Feb 5 event was called a caucus, here in NM, but it was really just a primary. I would agree with original poster: caucuses deny the right to a secret ballot and privacy, and also disenfranchise elderly, single moms, or disabled. If the Obama supporters at the caucuses were as aggressive (and sometime, downright rude) as they are on the message boards, I would hesitate to consider it as calm or rational as it should be. Primaries provide more opportunity for everyone. Caucuses reward retail politics, boots on the ground, like Dean's 50-state strategy. Primaries reward big media buys and negative campaign ads, sound-bite and gotcha politics. I know which one I think is better for the nation. It will be interesting to see if Clinton can improve her performances in the remaining caucuses. My guess is she will start to do a little better, but still not win because of the organizational aspects of the process. Clinton's problem with caucuses goes back to the initial design of her campaign. It is hard to patch together a repair at this late date. It is Retail Politics, but it involves making small investments in local organizers early on, and depending on them to set and increase the tempo as you move toward Decision day. You get and keep supporters by doing small events, Obama, for instance benefited from Move-On's house parties, which established lines of communication using E-Mail that multiplied his support base. From what I can tell -- Clinton just didn't understand that a Caucus begins a month or 6 weeks before the date, and during that time you organize, and build your support base. The votemaster seems to be implying that Clinton is really getting way more voters, because she's winning the primaries where more people vote, and Obama is only winning the caucuses. The problem with this is that total votes nationwide so far are so close you can't separate them. In fact, if I'm not mistaken, Obama has received more votes than Clinton. Also, NM is not a caucus in the sense you mean it in the post. You just go in and vote secretly. Lukeness, is it correct that many more people vote in primaries than in caucuses? You're right that that assumption is axiomatic to the Votemaster's suggestion that caucuses "filter" for the most-motivated voters. The alternative hypothesis that Obama supporters are better at persuading undecideds in person than Clinton supporters are, would still work if caucus and primary turnouts were similar. Do you happen to have those numbers? LauraJMixon, the tables above are (as noted) from the electoral-vote.com post I was commenting on, and naturally reflect the numbers as reported when that post was written (9 am Wednesday). They are certainly not meant as a live feed to ongoing vote-tallying. The nature of the New Mexico votes is already noted above, but I appreciate your verification of it. N0.1 reason I like Caucuses, they can't be hacked or rigged like Diebold or hanging chads. All of the above. The clearest to me being the a -C- tends to attract people a little more interested than a -P-. Thus, they have dug a little deeper than what one sees on the idiot box. The big problem for Hillary is that Obama will likely continue to win the -C's-. However, primaries tend to favor the well funded who can put their message out over the idiot box. Hillary probably never calculated that Obama would be raising triple the funds she does. Thus, he is now able to strong arm her in area that most affects primaires, TV. Obama's got the sophisticated, and he now has the means to be tops in TV as well. No wonder Hill wants debates - She sees the writing on the wall. Obama still has progress to make to shift the tide in primaries, but with his cash Hill is in the weeds. Plus Texas is likely to be the decisive battle, and she ain't so popular down here. We'll see. Hillary clearly never planned on being in a position of having a better funded Opponent. She may pull it out yet, the illuminatie want her on top of the ticket, and they have many tricks, but Obama is looking mighty tough right now. I was an Edwards man, but I say go Obama - go. Total PRIMARY wins to date: Obama 9, Clinton 9. And obviously 9 out of 10 caucus wins with NM's 17,000 provisionals pending. Hillary's lone caucus win also got Obama more delegates. Her primary states are bigger. That is where name brand comes into play better. When you have 10 days to cover 22 states there are obviously a lot of voters who will have an info gap between the best name brand in Democratic politics and the newcomer. That huge national primary day was always going to be his toughest hurdle over the candidate who ran an incumbent-style campaign. I think Obama will be favored in the following primaries, going west to east: Oregon, Montana, South Dakota, Mississippi, North Carolina, Virginia, Maryland, DC and Vermont. I think Clinton will be favored in Ohio, Indiana, West Virginia, Kentucky, Pennsylvania and Rhode Island. Wisconsin is a tossup and Texas is a caucus/primary hybrid that favors Clinton. At the end of the day, he is going to nearly sweep caucuses and win more primaries. And they still might take the nomination away. "Only highly motivated people bother to show up, especially the Democratic caucuses, which go on for hours and people have to publicly defend their choice." This isn't really true here in Minnesota. The caucuses have a dual purpose: 1) to cast presidential preference ballots, and 2) to propose and debate changes to the party platform. If a person merely wants to cast a presidential preference, he need only sign in, cast a ballot, and leave. His vote will be counted just as if he had stayed for the whole caucus. Marcy, I live in a caucus state (WA) so I can tell you a little about how that analysis sounds from here. First, Obama's lopsided majority here was due almost entirely to the youth vote, which showed up in droves. On the day before we caucused, many local public high schools bussed their students to his rally at a local sports arena. The next day, 17-year-olds were allowed to vote if they registered on the spot, and many of them did (including my own daughter). No one except 17-year-olds was allowed to register this way. In my little group, there was a significant amount of hand-wringing about HRC's fabled status as the Woman Republicans Love to Hate. Most people seemed very anxious to win in the fall, and there was almost no discussion of issues. I'm not sure at all that what I've described is evidence that caucuses foster participation in the Democratic process. The young people in my precinct who voted for Obama left as soon as that part was over. They came to be part of the "Movement," (that's the word one of them used) and left the dull stuff to the elders. Still, it's better than total disinterest. This posting is late, but the 26th amendment to the U. S. Constitution only gives an American citizen the right to vote if they are at least 18 years old. In response to the last posting.